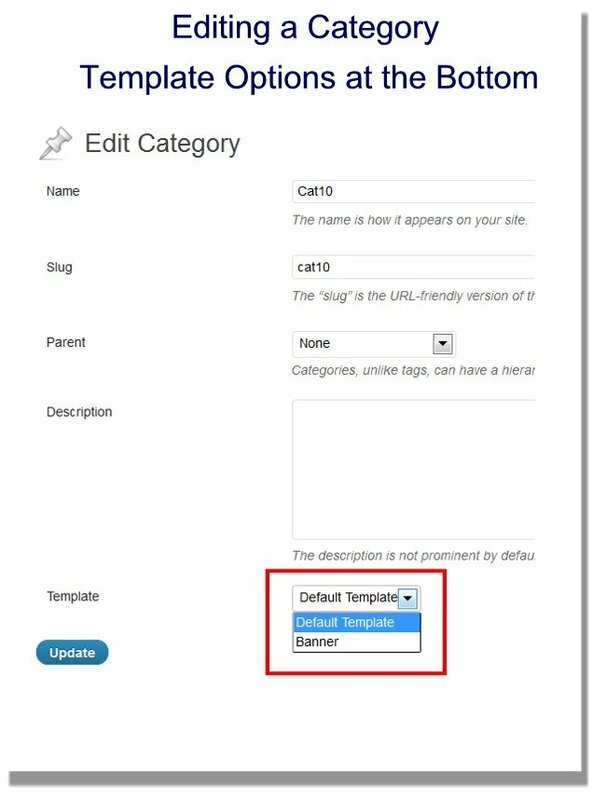 You may know that you can create templates for your category pages in order to make them unique. 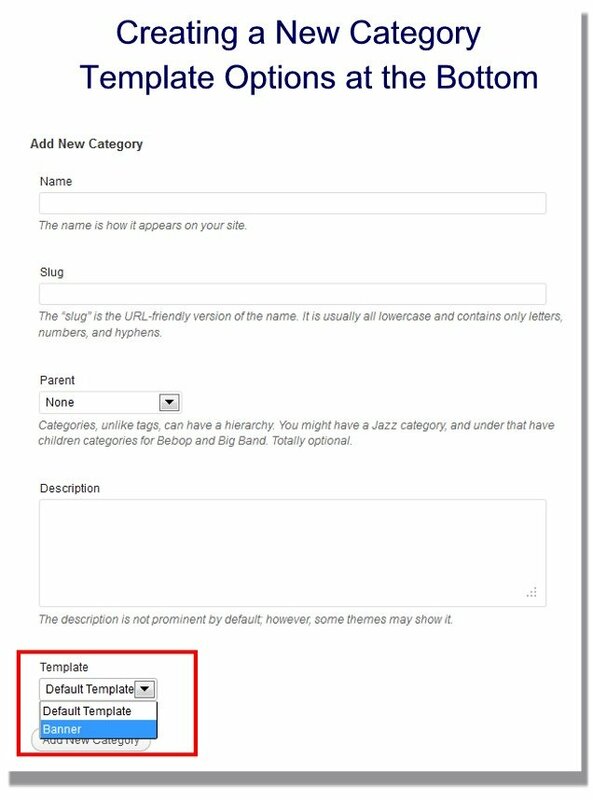 For example, if you have a category titled “Music,” you can make a template for that category (category-music.php) that you can then style differently. But what if you had five categories that you wanted to look one way, five other categories you wanted to look another, and then five more you wanted to look yet another. Even though you only had three different designs, you would need to make fifteen separate category templates, one for each category. Luckily, there’s a simpler solution – a plugin called Custom Category Templates that lets you create multiple category templates that you can apply over and over again as you would a Page template. So in our example above, instead of making fifteen different templates, you would only need to make three, and then apply the correct template to the correct categories. The plugin itself is very simple; however, some may not know how to make a category template, and so we’ll go over that first. If you already know how to make a category template, you can skip to the bottom to see the plugin in action. 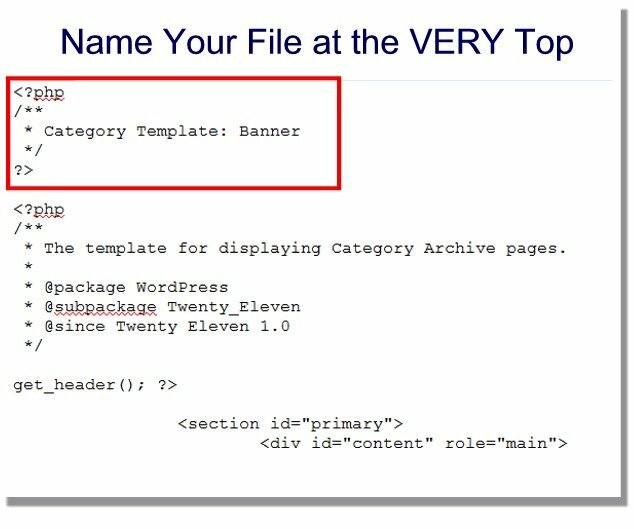 You will need to create these category templates on your server. In the folder of your theme (wp-content/themes/theme-name) find the file titled category.php. Open it and copy the contents, so you can use that as a starting point for your new category template. Create a new category template file and name it something descriptive. It MUST start with the word “category” and then a hyphen (“category-“). Also, it MUST end with a “.php” file extension. Now, open the new file you’ve just created (category-banner.php) and paste the contents from your original category.php file into it. Now you can edit your new category template to make it as you like. In this example, I am going to add a banner to this template. 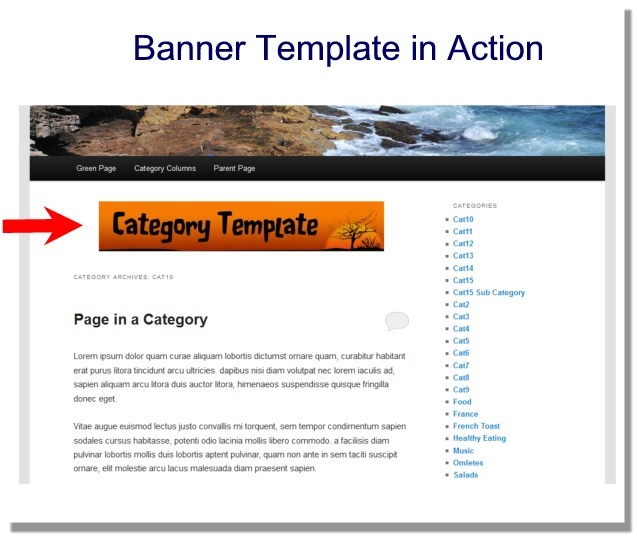 This means that the banner I put in will show up on every category page that gets assigned this template. Here’s the banner I am adding to my template. Now that we have the plugin activated, and we’ve made a new category template, we will see options to choose the category templates 1.) when we create a new category, and 2.) when we edit existing categories. The option to choose a template also appears at the bottom of the page when you are editing an existing category. And here’s the result of my banner template test.